Cynthia Trygier Interiors is your complete source for your interior design needs, including custom blinds and window treatments. You will receive only the highest quality in service and products. We pride ourselves in superior workmanship and close attention to detail. We work closely with you on every custom project and make appointments to fit your schedule, including nights and Saturdays. Call today for an appointment. I look forward to meeting you! Maybe you’ve just moved into your new home, or maybe you’d like to redecorate your existing home, the whole house, or one room at a time. Or maybe you’ve started to redefine a room, but don’t know how to put it altogether. Just call for an in-home consultation and we’ll help you with all the details. On our first appointment, we’ll start with a dream sheet. I’ll listen to all of your ideas, wants and needs to help you turn your dreams into reality. Are you thinking about new furniture, or adding a few accent pieces? I can shop for you, or we can go together…I know some great places to help us! Do you need a room painted or want to have that extra special look of a faux finish? Or perhaps you’d like to add a beautiful rug or refresh a room with new carpet. I’ve got just the perfect people on my team to get the job done right. Did you just move into the house of your dreams, but it feels like you’re living in a fishbowl? Or do you just need to update some old blinds? We carry the full line of Hunter Douglas blinds, an industry leader in product safety, innovative lift systems, and award-winning designs. Everything will be brought to your home so can see the samples and colors in your natural light. We’ll measure on our first appointment and help you make your best selection, taking into consideration function, style, light control, energy efficiency, and ease of operation. You don’t even have to worry about installation. We do that too! Click here to see the full line of Hunter Douglas window fashions. Are you ready to give your room warmth and show-stopping beauty? This is our specialty! Cynthia has over 30 years of sewing experience and loves creating one-of-a-kind window treatments. 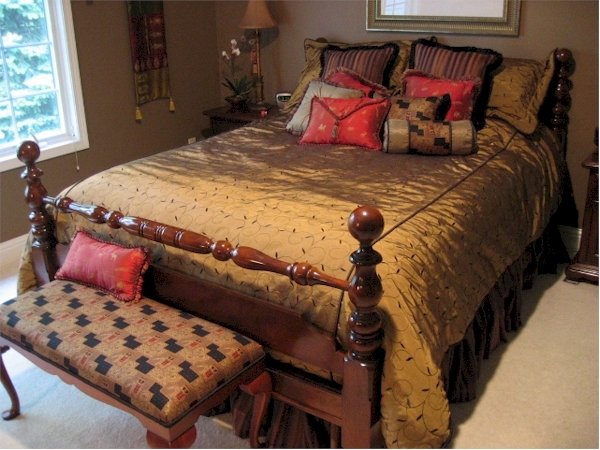 Cynthia will assess each room on her visit with you, and she will listen as you explain your ideas and personal style. Then she will help you make the best selection from rich fabrics, luxurious trims, and beautiful hardware for your project. For your convenience she will bring everything to your home. Cynthia will measure, create renderings, order all the materials, construct your window treatment, and install it. 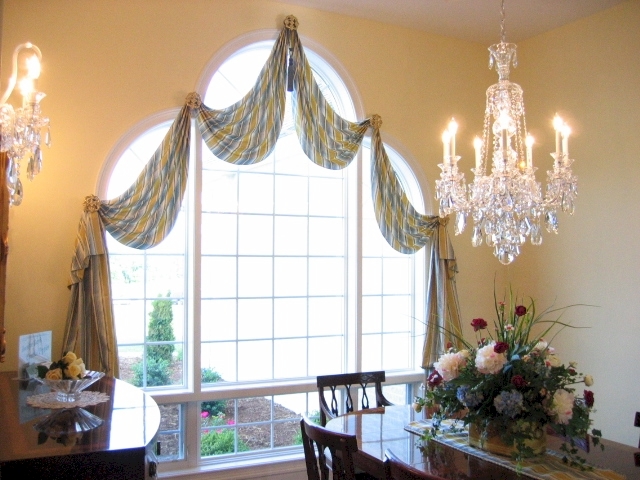 Each window treatment is completed with utmost attention to detail, giving you a true work of art. Whether your style is modern, traditional, or country. Or your taste is bold, elegant, or simple. Anything can be done, just for you. Besides giving your windows that finishing touch, Cynthia Trygier Interiors will make anything else you need to complete the room: pillows, table skirts, bed skirts, comforters, bedspreads, chair cushions, placemats – even a Christmas tree skirt! Do you have a beloved piece of furniture that looks tired and worn? Or do your dining room chairs need a different color to coordinate with those new window treatments? We have great fabrics and trims to choose from to give it new life. We can even make a brand new footstool to go with your most comfortable reading chair. No piece is too big or too small to recover.